The ZNCN/7002 Valve are extremely robust. They have been developed to general use on compressed air supplies, principally the main air lines feeding pneumatic circuits. These valves can be used as 2-port on and off valve, or as 3-port valve producing an open exhaust feature, which allows the downstream side to be vented to atmosphere. Its simplified construction (they have only one moving part) is such that only a simple 'push on' or 'push off' action is required to operate them. 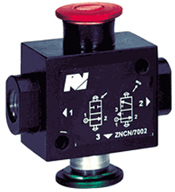 Each valve is supplied with colored push button giving a clear indication of the valve position. Operation of the Green push-button allows the air supply to the inlet port '1' to pass through the valve to the outlet port '1' when the red button is depressed with the sleeve in position the inlet and outlet ports are both completely sealed and the valve is able to perform a 'stop valve' function as a 2/2 valve. Removal of the sleeve enables the red button to be fully depressed to allow the outlet port to connect to exhaust via the slots in the position to provide a 3/2 function.